Labor leaders and Democrats want to rework a city policy meant to boost affordable housing production. The potential impacts of an update to the policy are debatable but this much is certain: The sought-after change isn’t a silver bullet to San Diego’s housing shortage or even its affordable-housing shortage. San Diego progressives are on a mission to change a city policy they hope can deliver more affordable housing. Labor leaders and City Council Democrats months ago decided the city must rework its so-called inclusionary housing policy to ramp up development throughout the city. The potential impacts of an update to the 15-year-old policy are debatable but this much is certain: The sought-after change isn’t a silver bullet to San Diego’s housing shortage or even its affordable-housing shortage. For more than a decade, the city’s inclusionary policy has given developers a choice. They can reserve 10 percent of the units in their projects for low-income renters, or instead pay a fee. Many developers have paid up. The city used the money to help build more than 30 affordable housing projects. Other developers have built affordable homes in their projects. The city’s inclusionary policy has helped deliver roughly a third of the affordable homes built over the last decade, Voice of San Diego found in an analysis of city housing production estimates and inclusionary program data provided in response to a public records request. Two-thirds of the 3,265 affordable units produced through the program during its 15-year run have been subsidized by fees developers pay instead of building affordable units themselves. But that production is far from what’s needed. Units tied to the city’s inclusionary policy over the past 15 years – whether built within market-rate projects, or built through the fees developers pay instead – represent the equivalent of just 8 percent of the affordable homes the state called on the city to build by 2020 to meet local demand. The city is far behind that target. By the end of last year, builders had provided less than a quarter of the affordable units the state recommended for the city by 2020. Progressives at City Hall, led by City Councilwoman Georgette Gómez, are rallying for a change. They want to force more developers to build affordable units in their own projects. They have watched as some large-scale projects such as the Town and Country redevelopment in Mission Valley have failed to commit to including affordable housing in their projects, and instead opted to pay the fee. Downtown inclusionary housing fee collections have spiked along with a building boom that Democrats believed should have also come with more affordable housing units. Legislation signed by Gov. Jerry Brown last year offered Democrats an opening. AB 1505 effectively reverses a 2009 court ruling that barred cities from requiring on-site affordable housing as a condition of rental development. That past ruling led San Diego and other cities to revise their inclusionary policies to make it far easier for developers to pay fees rather than build affordable units. City Councilman Chris Ward last fall wrote a memo encouraging the city to revisit its inclusionary policy shortly after Brown signed the bill. This summer, at Ward and Gómez’s urging, the City Council voted to begin exploring changes. Now Gómez’s office is hosting meetings with developers and housing advocates and ordering a consultant to assess the potential impact of their options, including requiring developers to build a higher percentage of affordable units in their projects. Gómez hopes to bring a proposed policy to the full City Council next spring. Developers and business leaders who have opposed the inclusionary policy in the past are for now supporting the process. Their most resounding message has been that Gómez should be careful not to inadvertently hamper housing production. They caution that increasing the requirement could complicate developers’ efforts to finance projects at a time when other costs are also escalating. “We need to make sure that what we’re doing does not impede the ability for developers to actually build the units, that can lead to the units that we all want,” said Matthew Adams of the Building Industry Association at a Wednesday City Council committee hearing. Builders aren’t the only ones sounding the alarm. State Sen. Scott Wiener, a San Francisco Democrat and AB 1505 supporter at the forefront of state housing efforts, has warned that increasing developer requirements could undermine efforts to build more housing. 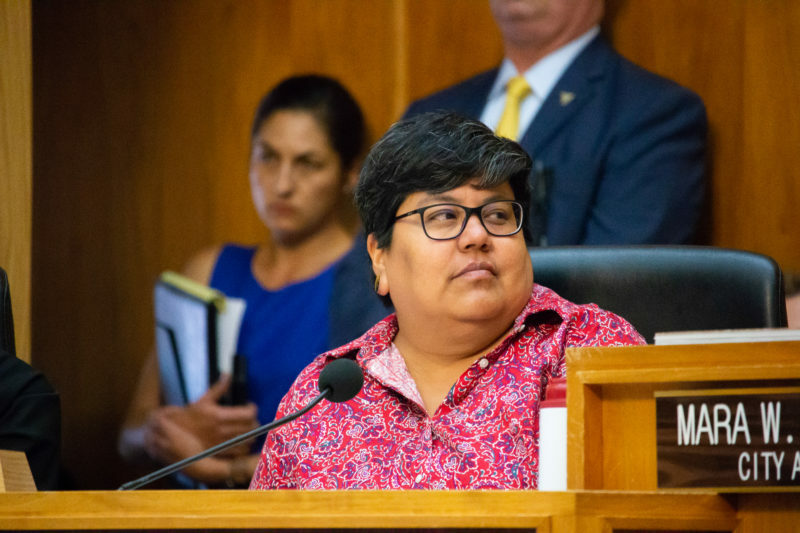 Gómez and Mayor Kevin Faulconer’s team, which is participating in the policymaking discussions, have said they want to create a policy that ensures more – not less – housing development. “Fundamentally, I think we’re all trying to achieve the same thing, which is increase the production and supply so we have more units,” said Elyse Lowe, the mayor’s chief housing adviser and director of the city’s development services department. Murtaza Baxamusa, a researcher affiliated with the county’s largest construction workers union, is one of the most outspoken voices advocating a more stringent mandate. He agreed that a balance must be struck and acknowledged that simply changing the city’s inclusionary policy won’t be an affordable-housing panacea. The policy update matters, Baxamusa said, because it could ensure that the city gets more low-income housing during building booms and that affordable housing is spread throughout the city rather than concentrated in certain areas or projects. “Inclusionary housing is the best way to tap into market forces to produce affordable housing,” Baxamusa said.